Comics, as an art form, have developed a heavily imitative business model. 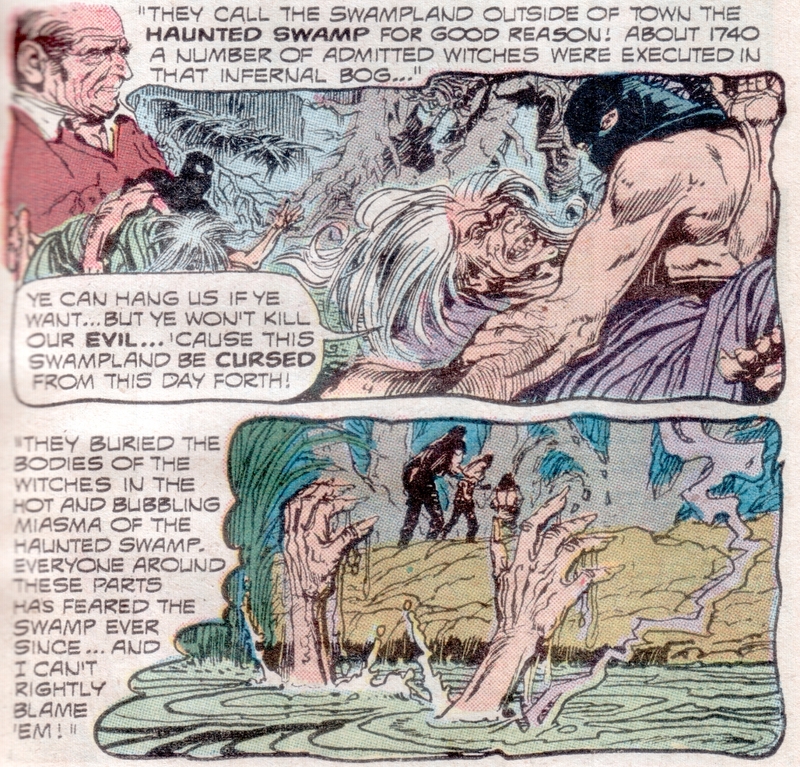 Most early horror comics were made in imitations of EC’s anthology format, complete with weird narrators. In 1972, Gold Key comics, one of several comics companies that survived until the early eighties, was still publishing comics digests, including Mystery Comics Digest. Tucked into the anthology of some nineteen stories including “Miracle of the Marne” and “The Ghost of the Gorilla” is “The Lurker of the Swamp.” By this time, there had been a certain amount of television pickup of swamp monsters. In November of 1972, Rod Serling’s Night Gallery aired a story adapted from Margaret St. Clair’s short story “Brenda.” Although not as popular as vampires of werewolves, but Swamp Monsters had at least touched the television medium. 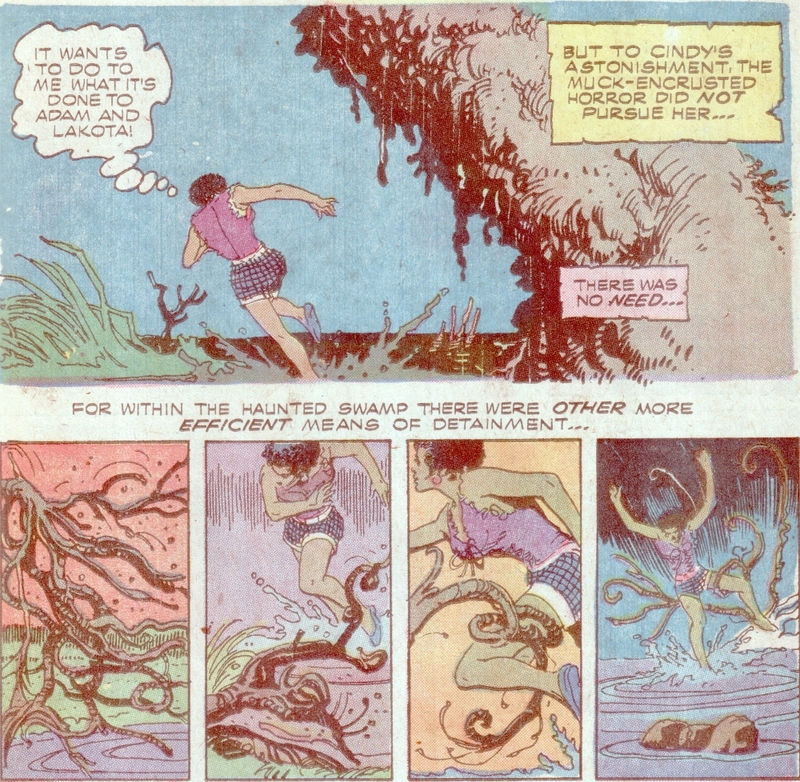 The Lurker is subtle twist on the now-standard Muck Man short story, in this case written by Don Glut and illustrated by artist Jesse Santos (nether of whom are credited in the digest itself). Bank Robber Martin Kraz returns home after a ten year stint, only to find that his buried loot is guarded by the swamp monster. Like the early Hillman Heap, the Lurker feels the need to feed, and it first sighted carrying off sides of beef from the local butcher shop. And like all swamp monsters, the Lurker has a powerful will to live that keeps the dead individual mobile. But Glut changed the formula, both for this as well as the Lurker’s later appearance in Doctor Spektor. For one, Martin Kraz is not a likeable character. And like Joe Timms from Like Roy Thomas's initial Glob, he’s a small-time criminal. Although Kraz has just been released from prison, rather than being an escapee. He discovers that the Lurker is the remains of his original partner, who helped him bury the loot. However, Kraz discovers that a gun does work on the swamp monster. But the curse of Haunted Swamp overcomes Kraz, and he becomes a mucky Lurker, even as the previous one dies. That said, there are several key differences that make the story stand out. One, the Lurker in the Swamp is not immune to bullets. So while the usual revenge (this time between two robbers) serves as the (apparent) climax of the story, Glut’s twist is that the Lurker dies, and the man who murdered it becomes the new Lurker. 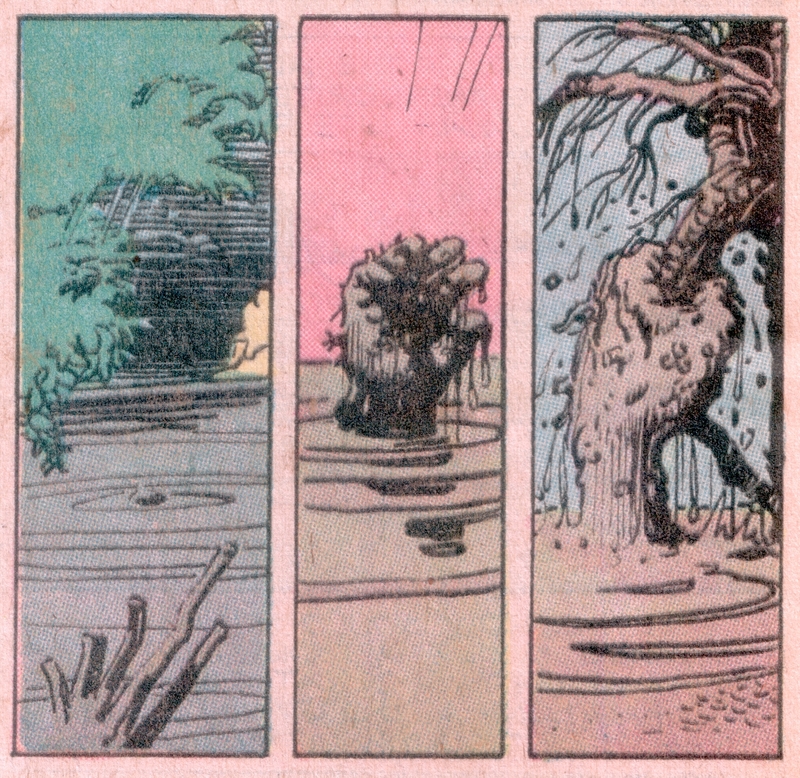 This idea of of the serial identity, that the swamp monster is not unique but an identity to be assumed, would not be picked up again until Alan Moore’s stint on Swamp Thing. Another twist on the tale is that the catalyst that changes the human into the Lurker is not pseudo-science, but supernatural. Haunted Swamp was where the local constabulary dumped the bodies of witches. Four years later, in 1976, Glut revisited his muck monster in his ongoing series The Occult Files of Doctor Spektor. The good doctor is an occult detective, created by Don Glut as a one-off for Gold Key's Boris Karloff's Tales of Mystery #5 (July, 1972). By April of 1973, Spektor had his own series, The Occult Files of Doktor Spektor, which reached twenty-four issues between 1973 and 1977, and a 2014 miniseries Doctor Spektor, Master of the Occult. Don Glut took several creatures from his time writing digest shorts into Dr. Spektor's ongoing series. And with issue 21 the Lurker and Doctor Spektor crossed paths. One of Glut's strengths is his in-depth knowledge of the genre, so he can anticipate where the reader believes the story is going. So the story is not a simple monster hunt, it has a good twist in the end. The Lurker has also changed a bit in the four years between its appearances. The Lurker Dr. Spektor encountered doesn't appear to be animated by the spirit of the criminal Martin Kraz. It is now immune to bullets, where the initial appearance was not. It also showed a new power, a command over plants. This once showed up in the Heap comic, and Glut says he had read several Heap comics, although it's difficult to say which ones exactly. Control over plants was a rare power among the Muck Monsters, or was until Alan Moore took the ability to the terrifying extreme with Swamp Thing. Post Moore, many swamp creatures would be able to control plants. Part of the change is the gentling the soul of the monster. Initially Spektor believes the Lurker is responsible for disappearances in the Haunted Swamp. And it seems like a good bet that it was. The Lurker, however, turns out to be benevolent, almost a guardian of the swamp, protecting the people of the swamp from a greater menace. And like Roy Thomas's initial Glob story, it sacrifices itself by walking into the quicksand. It's a good and surprisingly complex story. And Glut was savvy enough to show the mucky hand of the Lurker rising from the depths. Obviously, there's life in the old monster yet. Unfortunately, this was the last chance he got to write the Lurker, and in his interview for Swamp Men, Glut demonstrates a bit of disappointment that he never got to write a third Lurker story. To him, as to me, there is something unique and poignant about these mucky anti-heroes, something that allows us to write many stories on their oddly unfinished and inhuman features. And in Glut's two stories are the seeds of muck men attributes that will be picked up by later writers. I can only wonder what he could have done if he had continued with the character. The new Kong: Skull Island trailer is pretty interesting. First off, Kong looks like he did in the 1933 original. Short legs and erect posture. This makes him seem more human. The way people talk about him indicates he is not a raging beat, either. He also exists within a larger biome than he has been seen in previously. He didn't seem to really interact much with the other creatures of Skull Island in Peter Jackson's 2005 film. There is a greater diversity among the inhabitants, also. Not just classic dinosaurs, but also a giant mammal, what appears to be a water buffalo. Let's hope that some of the inhabitants show up and don't immediately get into huge fights. John Goodman, I suspect, is our link to the American Godzilla films. He says he's been trying to convince people about Kong's existence for years, so I suspect he's part of Monarch. I'd also like to know the nature of the military involvement in what is seems to be a purely commercial enterprise. But that's me. The initial trailer doesn't have the same punchy energy, but I think it tells us more about the film itself. At 1:52, you'll see a soldier firing off off a triceratops skull. Will they tease dinosaurs and not bring them out? The "Skull-Crawlers" are dinosaur-like, remind me of the serpent creatures in the Willis O'Brien original. the film takes place in 1971, and there are a lot of visual references to Apocalypse Now, considered one of the definitive films about the Vietnam conflict. You can bet I will be seeing this opening weekend.